Mickey is a very handsome Siberian mix puppy with stunning eyes, one blue and one brown, and soft, soft ears that just beg to be rubbed. He is approximately eight months old and is a medium size of 35 pounds. Mickey is a very smart boy – he knows sit, stay, lay and give me paw. He listens well and is quick to learn new commands. He is housebroken and crate trained. He is energetic, playful and affectionate. He is good with other dogs and children, but has that typical husky high prey drive, so he cannot be placed in a home with cats or smaller pets. 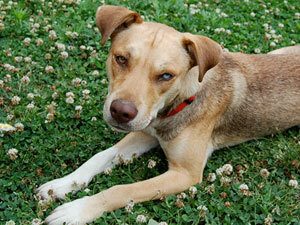 Mickey’s family love him very much, but need to find him a good home due to circumstances beyond their control. If you are interested in making Mickey a permanent part of your family, please let us know!